Many Filipinos have a special place in their hearts for Christmas and everything associated with this special holiday season. 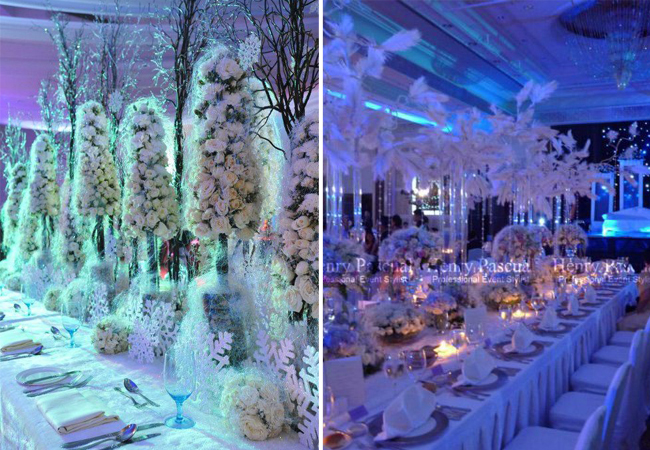 If you’re planning to celebrate your wedding along with this season, why not choose a Christmas wedding theme? 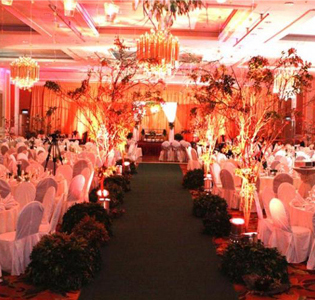 Here are some tips on how to celebrate a Christmas wedding in the Philippines. It will be a double festivity your guests will surely love. 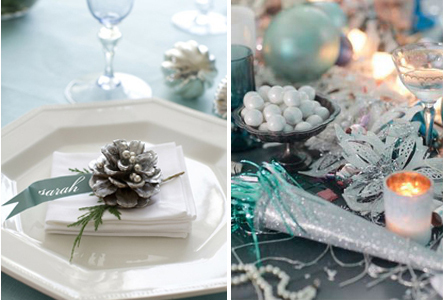 Before anything else, let’s discuss the Christmas details that you can incorporate in your wedding details. Making use of these details is up to you but we’ll still give some ideas to help you in conceptualization. Your imagination is the limit! Christmas Wedding Colors. Apart from the color green and red, you can also use other Christmas color motifs like silver and white, green and gold, silver and light blue or gold and cream. Christmas Symbols. Christmas symbols include the Christmas tree, stars, a parol [Christmas lantern], gifts, ribbons, mistletoe, wreath, balls, candies and candy canes, holly, the snowman, reindeers and snowflakes among others. Christmas Flowers. The most popular flower for the Christmas season is the poinsettia. Other plants you may use is the Christmas cactus or orchid cactus that is said to bloom during Christmas time. Other kinds of cacti may also be decorated to create that Christmas green vibe. 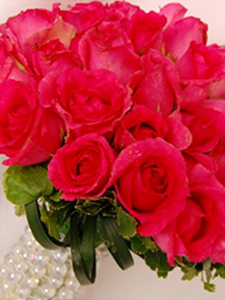 If you’re having a red and green theme, you can also use red roses. You can also use pine in your wedding décor. We’ve gathered some Christmas wedding inspirations from Philippine weddings and online to help you get started on your Christmas wedding! Christmas Reception Venue. If you think it will be hard for you to decorate a whole reception venue for your Christmas wedding, there are reception venues readily decorated for Christmas the whole year round. Christmas Wedding Cakes and Desserts. Your wedding cake can incorporate Christmas wedding details like poinsettia, silver balls, Christmas gifts and ribbons. It can even take the shape of a Christmas tree! Other wedding desserts like cupcakes and cookies can easily be transformed into the Christmas theme by using the Christmas colors and other Christmas details. Christmas Wedding Invitations. Your wedding invitations should not be mistaken as a Christmas card. Subtle Christmas details can be incorporated like snowflake details in an elegant white invitation. You can also be playful by using candy cane, Christmas tree and gift designs. Christmas Bridal Bouquet. 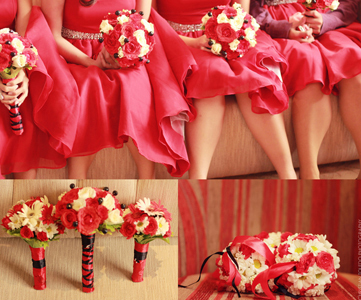 The bride and her bridesmaid can carry red bouquets made of either red roses or poinsettia. 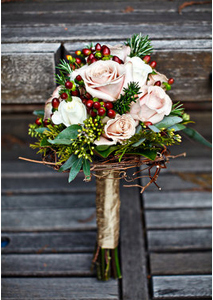 Other choices can be a bouquet of greens, browns and reds using pine, twigs, berries or cactus. Christmas Wedding Gown. The bride can wear any white wedding gown of her choice. 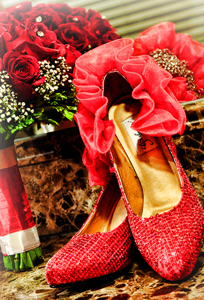 To add oomph to the festivities, she can bring a red bouquet and wear bright glittery shoes. She can also be playful and wear brown fashionable boots with her wedding gown or wear a silky red ribbon across her waist. 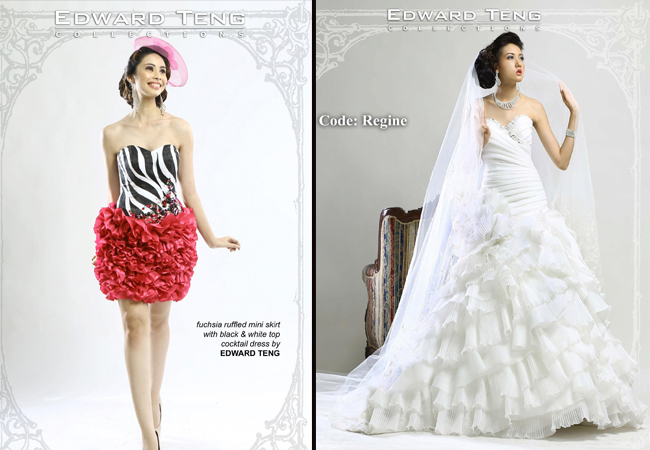 For a white Christmas wedding, the bride can choose a wedding gown with white gems and stones. Christmas Bridesmaid Dresses. 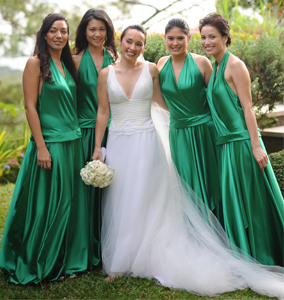 Depending on your color motif of choice, the bridesmaids can either wear white, red, grey, silver or green dresses. They can even dress as Santa’s elves by wearing custom Christmas hats to the reception. Christmas Boutonnieres. The groom and the male entourage can wear the usual tux and bow tie but with Christmas boutonnieres made of pine cones, pine, twigs and even some berries. Christmas Wedding Centerpieces and Décor. Flowers can be a bit expensive but don’t worry. Christmas wedding centerpieces can be elegantly designed with candles, pine cones and Christmas balls. For other décor and styling, couples can hang a Christmas stocking with their initials and use Christmas details on the program and guest seats. Christmas Wedding Favors. 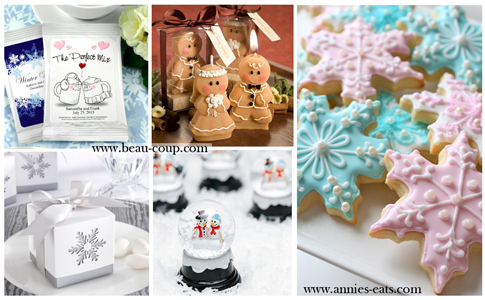 Your desserts can double as your wedding favors like gingerbread man cookies or Christmas cupcakes. You can also give away hot chocolate mix (in tune with the cool Christmas season) custom-designed and wrapped for your Christmas wedding. Other wedding souvenir ideas can be chocolates with custom Christmas wedding wrapping, couple snow globes, or even Christmas décor that guests can hang on their own Christmas trees. Come to think of it, you can have a memorable Christmas wedding any day of the year! It will surely be an affair your guests will remember forever. 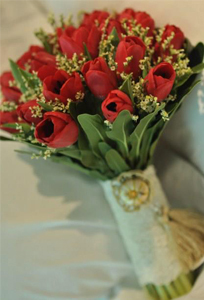 For more wedding inspirations, visit Kasal.com wedding photos. 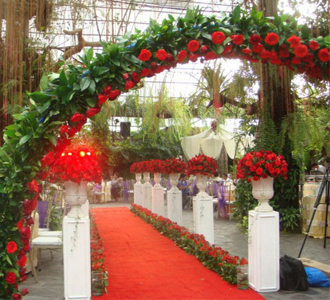 Need wedding suppliers for your Christmas wedding in the Philippines? Visit our Wedding Supplier Directory.